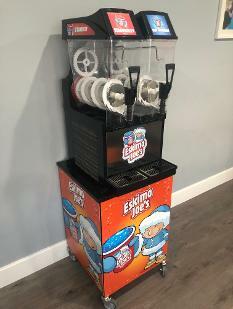 ESSEX SLUSH PUPPY Hirer of the best frozen slush drink machine in Canvey island, Benfleet, Southend Essex. 2 Tank x 10ltr Slush Machine, 70x 300ml cups, 70x Domed Lids and 70x Spoon Straws. Choose any two flavoured syrups to go inside your tanks! Trolley stand and side art panels included. Free delivery, setup and collection. 2 Tank x 12ltr Slush Machine, 85x 300ml cups, 85x Domed Lids and 85x Spoon Straws. Choose any two flavoured syrups to go inside your tanks! Trolley stand and side art panels included. Free delivery, setup and collection. 3 Tank x 10ltr Slush Machine, 100x 300ml cups, 100x Domed Lids and 100x Spoon Straws. Choose any three flavoured syrups to go inside your tanks! Trolley stand and side art panels included. Free delivery, setup and collection. Worried you wont have enough syrup and cups to supply all of your guests and don't want the expense of hiring 2 machines? Not a problem we have the option to add 10ltr of syrup of your choice and 35 more cups for an additional £30, all you would need to do is when your machine starts to get low just top it up with our pre mixed syrup and you will be ready to go again! 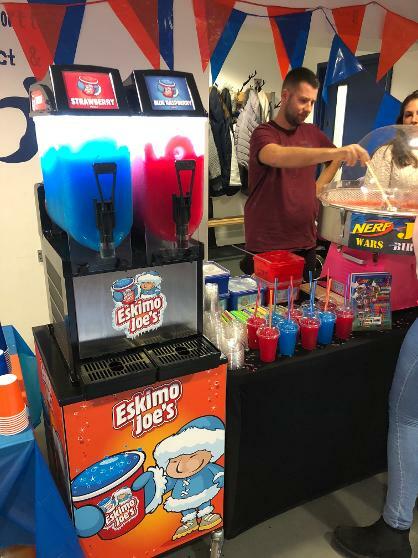 If you are looking to hire one of our most amazing slush machines for a special occasion or event, then you have come to the right place. Canvey Castles are equipped with the latest iced beverage machine on the market. 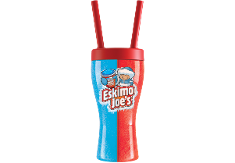 We have put together three packages that will enetertain all ages.Sweet, succulent, tasty, cooling and fun, our icy slushes are one of the most exciting party beverages that can be enjoyed no matter what the weather is like. 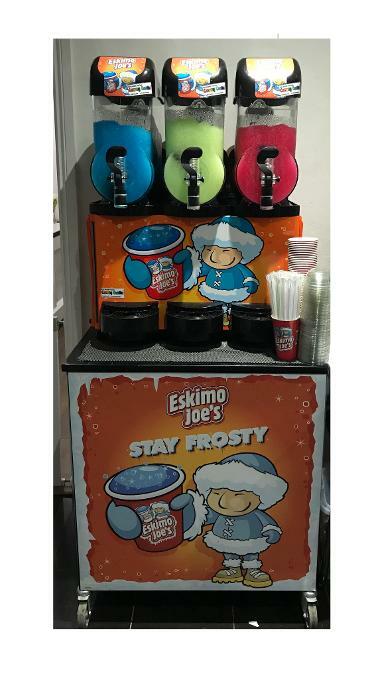 With the choice of three different flavoured slushes, your guests can either enjoy this refreshing drink on its own or mixed with another colour. 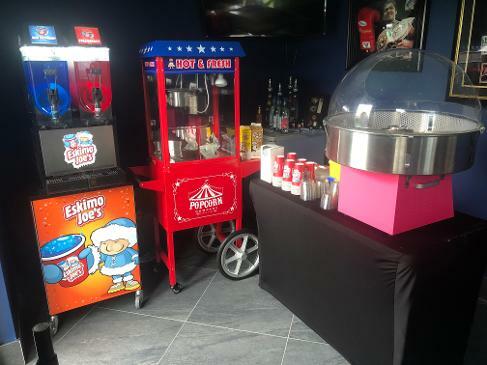 Our slush puppy machine will be a massive hit with your guests and loved by everyone! no matter how old they are. 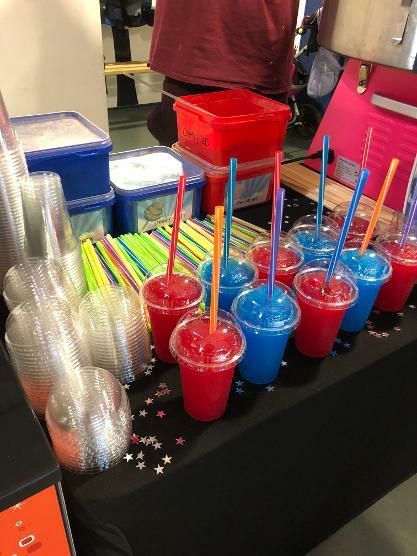 Our slush machines can be hired out for your birthday, kids parties, adult parties, christenings, wedding celbrations and fetes, with over 10 flavours to choose from. Our Candy floss machine is a great addition to your package and is just as popular. With many non alcholic cocktail sluch syrups to choose from, your guests will always remember the party you hosted as a modern, enjoyable night. With the option of adding an attendant to serve or even simply just self service. The fast freeze option within the appliance allows the cold drink to be ready to go within only 45 minuits of setup! All paper cups, domed lids and spoon straws would be supplied! Out of reach of electricity we also can supply petrol powered generators at an additional cost! 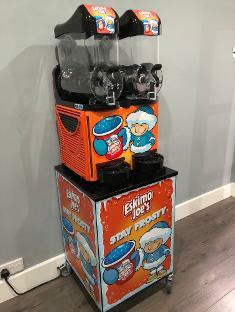 Canvey Castles are based in Essex but will travel and setup our slush puppy machines to our customers in surrounding areas throughout the South East. Southend on sea, Hockley, Rochford, Leigh on sea, Hullbridge, Stanford le hope, Grays, South ockendon, Tilbury, Basildon, Corringham, Billericay, Wickford, Chelmsford, Romford, Upminister, Westcliff, Southend On Sea, Stock, Laindon, Corringham and many more! Our dedicated team are passionate about the entertainment industry and our list of items to hire is one of the best in our area. Why contact loads of different companies when you can just contact us to cater for all your party needs. You can also fill out our contact form if you would prefer and we will call you back as soon as possible regarding your enquiries.